Speaker Corey Johnson's comments are a direct challenge to Mayor de Blasio, who is saying the exact opposite. As Mayor de Blasio gives drivers free rein, City Council Speaker Corey Johnson said for the second straight day that he wants to “break” New York City’s car culture. In both cases, Johnson was reacting to two pieces of news: several members of the council introduced bills that would legalize e-bikes and e-scooters — and some pro-car culture comments by the mayor. When asked about the e-bike and e-scooter bills, de Blasio repeatedly stressed that e-bikes pose a serious safety risk on city streets — despite statistics showing that drivers are responsible for all of the 145 people killed so far this year on the streets of New York. 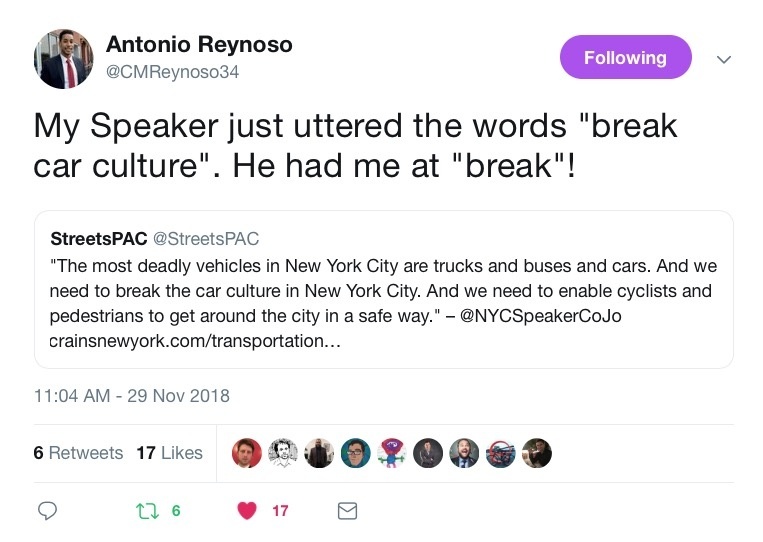 Then he went out of his way to defend New Yorkers’ driving habits. “We’re not telling people you can’t use cars anymore,” said the mayor, who has not fully endorsed congestion pricing, rarely rides the subway, gets driven in an SUV to his gym, and has been spotted on a bike only twice in all his years in the second most important job in the country. Contrast that with Johnson, who has certainly spoken about the need for cyclists to bike safely, but has also openly discussed his desire to reduce the number of cars entering Manhattan. He is so supportive of congestion pricing that he is investigating whether the city could implement it without state approval. And in his 11-month tenure at the helm of the city council, he’s already scored two major transportation policy achievements — a cap on the city’s for-hire vehicle industry and the reinstatement of speed cameras. The mayor’s office declined to comment. And the follow up tweets by folks have been equally good. Yay. Break is the correct word. People who unnecessarily own cars in this town weird too much political power. They think the streets, parking spaces and sidewalks belong to them and their metal boxes on wheels. They don’t. All it takes is one politician with guts to implement the policies. Maybe he won’t win re-election but he may become a future presidential candidate. Wow, I’m in awe–a public official who has a functioning spinal column. This is on par with Ross Perot once stating that the biggest problem with Texas schools was excess of spending on football! If you want to “break the car culture”, you need to roll the clock back to 1907 and find a way to prevent Henry Ford from starting the trend to make cars and their resulting travel freedom available to ordinary working people at affordable costs. Forgive me if I think this is utterly impossible – we have come to love our freedom to travel when & where we want. Walker, are you a secret Saudi agent who wants to see our money continuing to go to Islamofascist oil suppliers? Driving is, to a small extent, treason. Are you unaware that the USA is now the world’s largest oil producer and with some slight adjustments we could stop buying from Saudi? Calling driving treason at ANY level is utter nonsense. Conservatives always think it is impossible to change the culture, but then it changes anyway. Or, a very progressive president’s sec trans. Since oil companies buy from many sources at many different times, none could claim 100% US oil all the time. But we could do without any Saudi oil. Note also as cars and light trucks get more fuel efficient, the needs decrease. Nice to hear him voice this opinion, but what is he actually going to do to make the streets safer for those of us who aren’t part of car culture? Too many council members are willing to make statements like this, but when it comes to the day-to-day decisions about parking and safe streets and bike lanes and speed limits, they hem and haw and refuse to take any action that will make car ownership even a tiny bit more difficult. Color me skeptical. Driving is treason to the earth. Each step on the gas peddle, a worsening planetary catastrophe. So, we should all return to walking, cycling, and horseback riding with a probable limit of 10 to 20 miles a day? I’ve had strange replies before, but yours and Dave’s above take the cake. And, by the way, if you are worried about greenhouse gases, you need to get rid of all the cows that produce a lot of methane. Even in 1907 they had trains. wow he said that and lived? The only people who want to go back (to the 1950s) are the barons of the conservative fossil fuel industry. We are suggesting moving FORWARD with sustainable, mainly electric public transportation. The gross amount of public money spent on highways and auto infrastructure seems to suit fatcat lobbyists like yourself, but for us more logical people, we see public transit as a common sense solution to critical mobility issues. And, just in case you didn’t notice, trains only go to a TINY fraction of the places people want to go. Just in case you didn’t notice, trains and other transit solutions only go to a TINY fraction of the places people want to go. “fatcat lobbyist” – NO, I am an unpaid volunteer for the grass roots organization of the NMA which only has 3 full time employees – the rest of us are volunteers. The dearth of public transportation in less dense areas is due in large part to lobbying organizations such as yours. Strongarmed by the petro and auto industry, the government tore up streetcar tracks and interurban lines that connected even the tiny parts of the country after WWII. Today, we are trying to expand the network to reach more people. Elephants like the aforementioned industries will do their best to hinder our efforts at every turn. Yeah just replay the company line, collect that 401k, head off to the family summer home. Enjoy! No, it is due to the flexibility and affordability of private cars to go anywhere, anytime, at modest cost, and almost always MUCH faster in the door-to-door times than transit. Once cars became available at modest costs in the early 20th century, it was obvious to most people they were a better solution to transport. I am an unpaid volunteer for the NMA, as are most members. We have only 3 full time employees. We represent the interests of about 200 million US drivers, many of whom don’t even know that we exist – but we help keep their rights to travel when and where they want to without being seen as moving wallets for predatory for-profit traffic enforcement rackets. how does electricity for electric cars, scooters, and mass transit get made? High Sulfur Coal and Oil remain the primary source of fuel for electricity production in the eastern half of the US. Power generation plants are some of the largest single source polluters of CO, NOx, SO2, but are often in more rural areas. Generating electricity for cars or mass transit is just moving pollution creation to less politically powerful areas. This is dealing with the local symptom, and not the global problem. The rest of the world outside of NYC should say “no thank you”. The fix Corey Johnson is suggesting is shortsighted, and really no fix at all, just transferring the problem to somewhere else. I never had a problem riding 30-40 miles a day even when I just started riding a bike, right up to the point I pulled my hip and couldn’t get on a bike. But it also makes getting in and out of a big SUV a major issue, so I mainly walk and take the bus these days. You are astroturf, not “grassroots”. Then you don’t understand the history of the NMA. I’m pretty sure most people who drive, myself included, would be horrified by the suggestion that the NMA’s cavalier attitude toward traffic deaths represents them in any way. Travel today is over 75% safer per mile than in 1960 when I got my first license. If you are in a car for about 15,000 miles a year, you will be involved in a crash fatal to a pedestrian, cyclist or vehicle occupant about once in every 5,700 years. Driving is extremely safe today on almost every trip we all take. The only reason the total fatality numbers are high is the 3+ trillion miles we drive in the USA – with our freedom to travel in very safe cars on mostly safe roadways. We could make faster progress toward fewer fatalities if we could get profits out of enforcement, so our scarce enforcement resources could be 100% on safety and 0% on profits. Streetsies 2018: Corey Johnson is the Vision Zero Hero of the Year! To cap an amazing year, the Council Speaker sits down with Streetsblog to, as he put it, break the car culture. Gov. Cuomo will let towns and cities in New York decide for themselves whether to allow e-bikes and e-scooters on their streets.